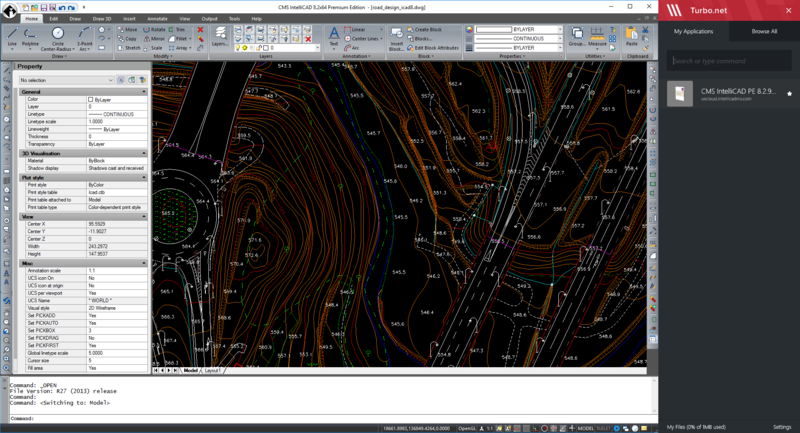 CMS IntelliCAD® Premium(PE) Easy Run is a fast and efficient DWG file Compatible and Alternative CAD program with all the power and versatility of standard programs such as AutoCAD® by Autodesk®, Inc., or MicroStation® by Bentley Systems, Inc., at an affordable price. CMS IntelliCAD PE Easy Run, the always maintained time limited subscription or perpetual license, streams directly from the Internet in to your system and runs locally as any other installed software. Once downloaded, just runs without install. Plus, you will always keep your files where they have always been. Contrary to the standard cloud technology concept, with CMS IntelliCAD Application Streaming technology you will never need to upload your files to a cloud server space you do not control. Your files, your property! It's supported by any Microsoft Windows 7, 8 and 10 64-bit systems without any license management requirements. Freely tryout CMS IntelliCAD Easy Run for 15 days! CMS IntelliCAD is also available as Perpetual Standalone or Network floating license supported on Microsoft Windows Operating Systems. Get all the features of CMS IntelliCAD as free trial for 15 days! Native .DWG file support - from version 2.5 to 2018 - New Unbeatable file format compatibility. CMS IntelliCAD includes native .DWG file support - from version 2.5 to 2018. Plus, it also supports dxf, dwf, dgn, pdf and image underlay, sat, dae, svg files and more.